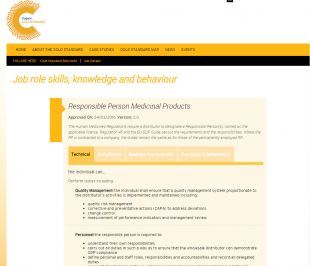 This is the third in a set of three posts centred around the Responsible Person (RP) named on a Wholesale Distribution Authorisation (WDA). The first post provided information on external training recognition and training providers. The second post aimed to enhance the appointment of the RP. This third post will place a particular emphasis on the engagement of a contract RP. The inspectorate has tried to raise the role profile by working with Cogent to develop the Responsible Person Gold Standard, see the earlier post describing how training providers can now be approved. The inspectorate has tried to raise the profile in other ways. In many cases inspection deficiencies are now cited against the RP and this has been effective in demonstrating to the Licence Holder where the weak link is. In a few cases, the licensing authority has seen it necessary to take action by compulsorily varying the licence to remove an RP. With this greater awareness, the inspectorate frequently finds the Licence Holder turning to outside consultants to fulfil the role of the RP. This provides additional challenges along with the expertise the consultants can bring. The use of contract RPs. Contract RPs are a significant feature within this industry. From small and medium size businesses who find a contractor to be a cost-effective solution, to large multinational operations requiring additional support; the outsourcing of this position is not uncommon. A contract RP is in a unique position, operating with a high level of responsibility for organisations with often diverse business streams creating additional risk. This is a significant responsibility on the part of the Licence Holder (or licence applicant) and the RP. Ultimately it is the Licence Holder’s responsibility, as contract giver, to demonstrate the selected consultant is suitable for the role of contract RP within their particular business model and this must be defined in a suitable contract. This contract should name the RP as named on the licence; it is not sufficient to name only the consultancy. 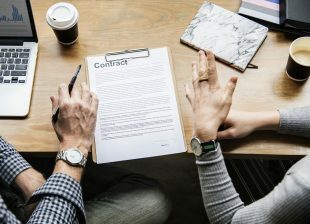 The contract should cover the scope of the role, respective duties and responsibilities for the contracting parties, and the availability of the RP and should be regularly reviewed. The Licence Holder should review the performance of the contract RP on a regular basis and be prepared to act if there are any indications of unsuitability. Time should be spent by a contractor in ascertaining the full context of activities conducted; including any other companies closely linked. 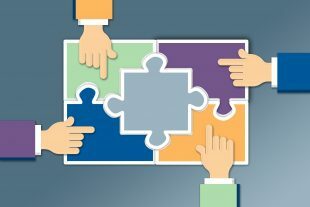 Understanding the activities performed by a company or at a site, including operations and their culture, is essential before agreeing a contract. Failure to properly examine other areas of a business can result in failing to identify other GDP related activities conducted by the site to which the Licence Holder – and the RP – may be unaware. The contractor should have a thorough understanding of operations before their appointment – ignorance of activity is not a defence and the consequences of non-compliance to a consultant’s reputation can be significant. When a contractor is comfortable with and fully aware of the business model, they must then consider the company culture and access provided by a company. The defined responsibilities of the RP are wide ranging and appropriate tools should be in place, or implemented, to ensure that duties can be executed properly and appropriately. This is especially important considering that as a contractor, an RP may not be on site as regularly as a full-time employee. How would a contract RP position themselves as to effectively execute their authority? Would the Licence Holder be supportive of such measures? Are the right people in place to support a contract RP during off-site times? To assist with compliance, the RP should have a direct reporting line to the Licence Holder or managing director. When operating under the contract, generalised solutions are unlikely to be appropriate; it is not acceptable for the RP to introduce a generic quality system that has not been tailored to the Licence Holder. This is frequently seen by the inspector and can lead to wide-ranging problems with compliance. The contract RP must have a suitable training record available to the licence holder and inspector. They must put time aside for their own learning, regulatory awareness updates and professional development in addition to their licence commitments. The MHRA is aware of the numbers of licences that an RP is named on and will expect that a contract RP would be able to facilitate all functions for all sites concerned. This is a highly demanding role, and several factors should be taken into consideration as to their workloads and demands. Depending on business models, the range of what would be considered appropriate can vary greatly. In cases where critical concerns have been raised, the MHRA may refuse variations to add RPs or propose a variation to remove the RP in question. Critical findings could result in other licences, on which an RP is named, being reviewed. The Licence Holder and the contract RP should be aware, and remind themselves, that contracting for a company is a serious commitment and requires a high degree of vigilance. In many cases, the contractor may be the only individual working for a company who has GDP and Human Medicines Regulations awareness. As the RP, a contractor is in a unique position to ensure that the conditions of a licence are within compliance. This poses a significant challenge to the contract RP and Licence Holder. Ultimately, the responsibility to ensure the quality of medicinal products, and patient safety, fall on their shoulders. We hope that these three posts will have encouraged conversations around the role of the RP. There is a clear role for the Licence Holder in assessing the suitability of an RP. The Licence Holder must assure themselves as to the RP’s ability to carry out the licensed functions. Non-compliance will place significant burden on both a company and an RP. Every company is unique, and an RP should be sure they can execute their responsibilities to meet the requirements of the licence. I am pleased to see these posts and attempts to raise the profile of the RP. It can be difficult to get the recognition for the high level of responsibility involved.